Why did a moon trip fail to take off? On January 24, when Bengaluru’s space startup TeamIndus and its launch contractor, Antrix Corporation, the commercial arm of the Department of Space and the Indian Space Research Organisation, jointly announced that they had called off their year-old agreement, not many were surprised. The agreement was for hurling a TeamIndus spacecraft to the moon on an ISRO rocket. A small consolation for TeamIndus was that at the same time, the agency that conceived the moon-landing contest, the Google Lunar XPrize, back in 2007, declared that none of the five international finalists would be able to meet its $30 million challenge. Which was to soft-land a spacecraft on the moon, move a robotic rover for 500 metres on the lunar terrain and make it send videos and pictures from there — all this before March 31, 2018. It was mandated that each team must be at least 90% private-funded. A galaxy of corporate icons such as Ratan Tata, Biocon’s Kiran Mazumdar-Shaw, Nandan Nilekani and Rakesh Jhunjhunwala were among the 70-odd individuals who blessed TeamIndus and put their money in it. Some of ISRO’s retired brains, who had led its 2008 Chandrayaan-1 and Mars orbiter missions, were roped in, and the former ISRO Chairman, K. Kasturirangan, mentored the team. TeamIndus also won an encouraging milestone prize of $1 million. In December 2016, it found timely space transport: ISRO’s PSLV rocket. Yet, in the end, with all the positives, why could not it reach for the moon and the bounty that its 100-plus young engineers were slogging for over seven years? Pioneering state-funded lunar landing missions of the U.S. and the former Soviet Union did not succeed at first shot. As the Google Lunar XPrize itself conceded, a private-funded “moonshot” is not easy. It noted that the teams could not raise the funds they needed; they also ran into technical and regulatory difficulties. Antrix and TeamIndus, which are contract-bound not to disclose details of the deal, have not clarified the whispers around the cancelled launch. However, in November, even while the project was on, the then DoS Secretary, A.S. Kiran Kumar, said in a television programme that TeamIndus had many challenges before it: money, technology and readiness. While TeamIndus CEO Rahul Narayan later said, it needed another six months to raise the money for hardware imports for the spacecraft and the rover, those in the space industry doubt whether it still would have made it. TeamIndus raised about half of the $60-65 million (around ₹400 crore) it needed to complete the mission: new investors did not appear enthused. Space travel costs are high even it is a ride on an internationally economical PSLV. It may have cost TeamIndus ₹150-200 crore plus insurance to launch its 600 kg spacecraft. In the 2008 Chandrayaan-1, for example, the launch alone might have cost the ISRO more than half the ₹380 crore total mission cost. TeamIndus was to pay Antrix in instalments and clear the entire sum before the launch. There were murmurs that it made only the first payment. It is also not known how Antrix dealt with the issue when TeamIndus, on its own, sold part of the ride cost to another contestant, Japan’s Hakuto. The landing spacecraft and the rover should have been sent to the ISRO for flight qualification clearance about six months before the launch date. TeamIndus was nowhere near it. Mr. Narayan has said he and his friends initially created the company mainly for the contest. Its other business goals such as making small satellites and drones might have been woven around the mission later. TeamIndus may have had nothing to sell and earn in order to finance the trip. It still looks at the moon but in the end, the celestial neighbour proved to be too big a bite to be ECA (Ek choti si asha) or a tiny hope. TeamIndus had named its rover ECA, now grounded. I still remember screening of the film in December 1969 at Institute Menezes Braganza hall for school students in Panaji by American Information Centre, Mumbai, on NASA astronauts landing on Moon on July 20, 1969. The event changed my life and I decided to become a scientist. If things go as per schedule, then in last week of March, ISRO would launch India’s second Mission to Moon – Chandrayaan-2. This article is an early alert to local media and science teachers in all educational institutions who wake up late when India launches a major space-mission. 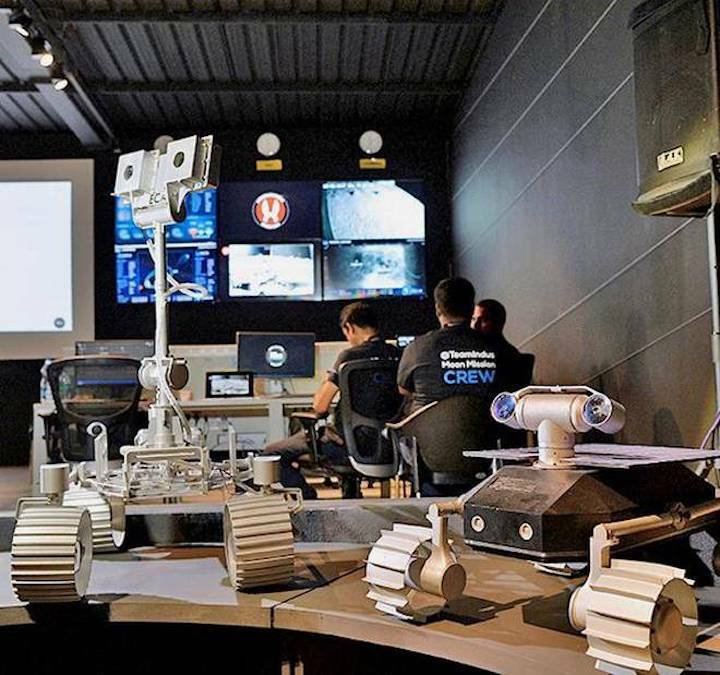 It is extremely important to educate and involve the students from a very young age in such historic missions because today’s generation is much more technologically advanced to understand the importance and significance of exploration of Moon. There wasn’t much enthusiasm in Goa during Chandrayaan-1 mission in October 2008 or more ambitious Mars Orbiter Mission or Mangalyaan in September 2014. Goa’s educational institutions including the three engineering colleges need to form Chandrayaan-2 clubs to monitor the whole mission and benefit from its results. As per ISRO’s official information “Chandrayaan-2, India’s second mission to the Moon is a totally indigenous mission comprising of an Orbiter, Lander and Rover. After reaching the 100 kilometre lunar orbit, the Lander housing the Rover will separate from the Orbiter. After a controlled descent, the Lander will soft land on the lunar surface at a specified site and deploy a Rover. The mission will carry a six-wheeled Rover which will move around the landing site in semi-autonomous mode as decided by the ground commands. The instruments on the rover will observe the lunar surface and send back data, which will be useful for analysis of the lunar soil. The Chandrayaan-2 weighing around 3290 kilograms would orbit around the moon and perform the objectives of remote sensing the moon. ISRO engaged IIT Kanpur to design and develop three subsystems to provide mobility – Stereoscopic camera-based 3D vision will provide the ground team controlling the rovers a 3D view of the surrounding terrain, kinematic traction control would enable the rover to negotiate the rough lunar terrain using independent steering provided on four of its wheels and control and motor dynamics for the 20 kilograms Solar power operated rover with six wheels, each driven by an independent electric motor. Four of the wheels will also be capable of independent steering. A total of 10 electric motors will be used for traction and steering. The payloads will collect scientific information on lunar topography, mineralogy, elemental abundance, lunar exosphere and signatures of hydroxyl and water-ice. The Rs 600 crores mission would be launched on a Geosynchronous Satellite Launch Vehicle (GSLV Mk II) sometimes in March 2018 with an approximate lift-off mass of 3,250 kilograms from Sriharikota Island. It would have five instruments on the orbiter. These include- Large Area Soft X-ray Spectrometer (CLASS) from ISRO Satellite Centre (ISAC), Bangalore and Solar X-ray monitor (XSM) from Physical Research Laboratory (PRL), Ahmadabad for mapping major elements present on the lunar surface. L and S band Synthetic Aperture Radar (SAR) from Space Applications Centre (SAC), Ahmadabad for probing the first few tens of meters of the lunar surface for the presence of different constituents, including water ice. SAR would scan and probe shadowed regions of the Moon to check for any evidence to confirm the presence of subsoil water ice. Imaging IR Spectrometer (IIRS) from SAC, Ahmedabad would do mapping of lunar surface over a wide wavelength range for the study of minerals, water molecules and hydroxyl ions present. Neutral Mass Spectrometer (ChACE-2) from Space Physics Laboratory (SPL), Thiruvananthapuram would carry out a detailed study of the lunar exosphere. Terrain Mapping Camera-2 (TMC-2) from SAC, Ahmedabad is programmed to prepare a three-dimensional map essential for studying the lunar mineralogy and geology. The lander payload includes: Seismometer for studying Moon-quakes near the landing site; Thermal probe for estimating the thermal properties of the lunar surface; Langmuir probe for measuring the density and variation of lunar surface plasma Radio occultation experiment for measuring the total electron content and rover payload would have-Laser induced Breakdown Spectroscope (LIBS) from Laboratory for Electro Optic Systems (LEOS), Bangalore, Alpha Particle Induced X-ray Spectroscope (APIXS) from PRL, Ahmadabad. The Orbiter High Resolution Camera (OHRC) will conduct high-resolution observations of the landing site prior to separation of the lander from the orbiter. This mission would see the 1250 kg lander making a soft landing to deploy the rover. ISRO began tests of Engineering models of the lander in 10 artificial craters in Challakere in the Chitradurga district of Karnataka in October 2016 to help assess the ability of the lander’s sensors to select a landing site. By using remotely operated robotic Rover on lunar surface ISRO would enter a new age of exploration of extra-terrestrial bodies. The rover would transmit the data of chemical analysis to ISRO ground station. As the pictures and data gets beamed back to Earth, the whole nation would feel and share the excitement of a new era in lunar research. From that moment India would not be very far from sending first astronaut to step on Moon and plan for a permanent lunar research station in this century. We need to inspire our students with such attainable dreams and positive vision of future. The lunar mission, Chandrayaan-2, under which the ISRO will for the first time attempt to land a rover on the moon's south pole, will be launched in April. Chandrayaan-2 will be ISRO's first inter-planetary mission to land a rover on any celestial body. The lunar mission, Chandrayaan-2, under which the ISRO will for the first time attempt to land a rover on the moon’s south pole, will be launched in April, Minister of State for Department of Space Jitendra Singh said on Friday. Chandrayaan-2 will be ISRO’s first inter-planetary mission to land a rover on any celestial body. “India is going to launch Chandrayaan-2 in April. It is under Chandrayaan-1 mission that the ISRO spotted water on the moon. Chandrayaan-2 is a further extension of the project and it is as good as landing a man on the moon,” Singh said. The rover of India’s second lunar mission, which will cost nearly Rs 800 crore, will be made to land near the yet-unexplored south pole, said ISRO’s newly-appointed chairman K Sivan. Sivan said it the south-pole is a “very tricky area” with rocks formed a million years ago. “It has very old rocks. This could possibly help us understand the origin of universe,” he said. “Most of the lunar missions in the past have explored the area around the equator of the moon,” he added. Sivan noted that the window to launch the mission is between April and November this year. “The targeted date is April. In case we miss the April date, we will launch it in November,” he said. Another reason, he cited, behind landing the rover near the south pole was that the area has not been explored by other missions. New Delhi: Chandrayaan-2, the lunar mission under which the Isro will for the first time attempt to land a rover on the moon’s south pole, will be launched in April, Jitendra Singh, in-charge of the department of space said on Friday. The rover of India’s second lunar mission, costing nearly Rs 800 crore, will be made to land near the yet-unexplored south pole, Isro’s newly-appointed chairman K. Sivan said. “India is going to launch Chandrayaan-2 in April. It is under Chandrayaan-1 mission that the Isro spotted water on the moon. Chandrayaan-2 is a further extension of the project and it is as good as landing a man on the moon,” Mr Singh told reporters here. Chandrayaan-2 will be Isro’s first inter-planetary mission to land a rover on any celestial body. Mr Sivan noted that the window to launch the mission is between April and November this year. “The targeted date is April. In case we miss the April date, we will launch it in November,” Mr Sivan added. Citing the reason behind landing the rover near the south pole, Mr Sivan said it is a “very tricky area” with rocks formed a million years ago. “It has very old rocks. This could possibly help us understand the origin of universe,” he said. Another reason, he cited, behind landing the rover near the south pole was that the area has not been explored by other missions. “Most of the lunar missions in the past have explored the area around the equator of the moon,” Mr Sivan added. Chandrayaan-2 is India's second foray to the moon and the Rs. 800 crore mission aims at putting an orbiter around the moon, from which a lander and a rover would detach and reach the lunar surface. 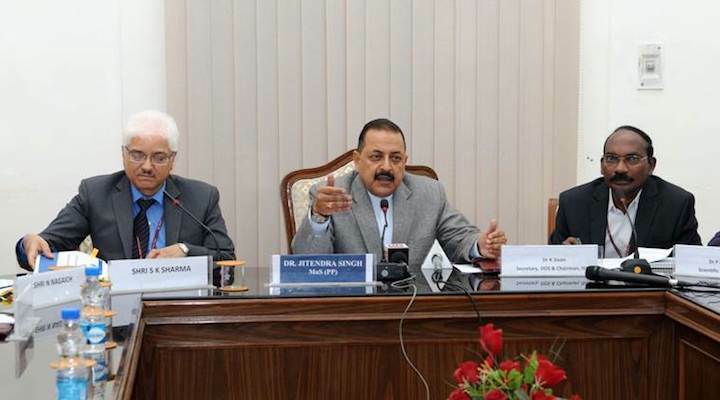 NEW DELHI: India's most ambitious space mission yet, Chandrayaan-2, that hopes to place a robotic rover on the moon could be launched as early as April this year, says Dr Jitendra Singh, Minister of State in the Prime Minister's Office that is in charge of space affairs. "Chandrayaan-2 is one of the most remarkable ISRO missions of 2018 and it will be a world event," Dr Singh told NDTV. Only USA, Russia and China have been able to soft-land spacecraft on the lunar surface. If India succeeds, it will be a huge achievement for space agency ISRO that has a budget almost 20 times less than US space agency NASA. Dr Singh says Chandrayaan-2 with its many scientific capabilities will throw up data that "may open up possibilities of future habitation of the moon". There are tantalising possibilities of a human outpost on the moon in the future and India is already investing in its human space flight programme. 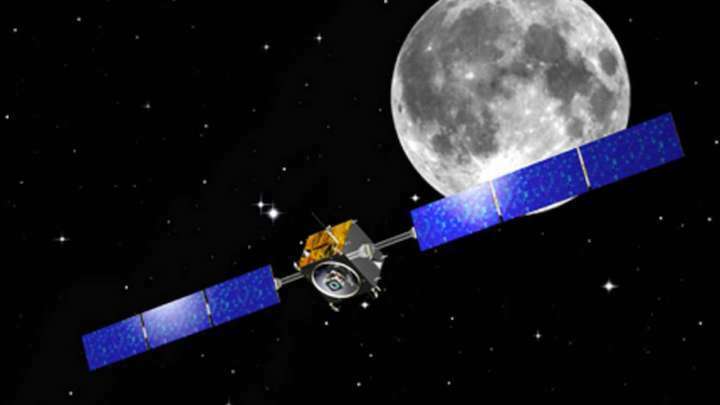 ISRO seeks to land Chandrayaan-2 very close to the South Pole of the moon. Chandrayaan-2 is India's second foray to the moon and the Rs. 800 crore mission aims at putting an orbiter around the moon, from which a lander and a rover would detach and reach the lunar surface. Landings in thin atmosphere and low gravity of the moon are very tricky. 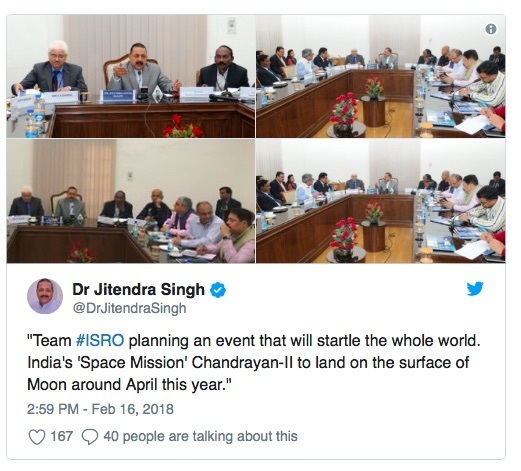 "Even though Neil Armstrong had walked or, one can say, taken a stroll on the lunar surface in 1969 but it was left to India's small Chandrayaan-1 space craft launched in 2008 that discovered the presence of water molecules on the parched lunar surface in 2009," said Dr Singh. The work does acknowledge that India helped discover water on the moon which was considered a parched environment till then. 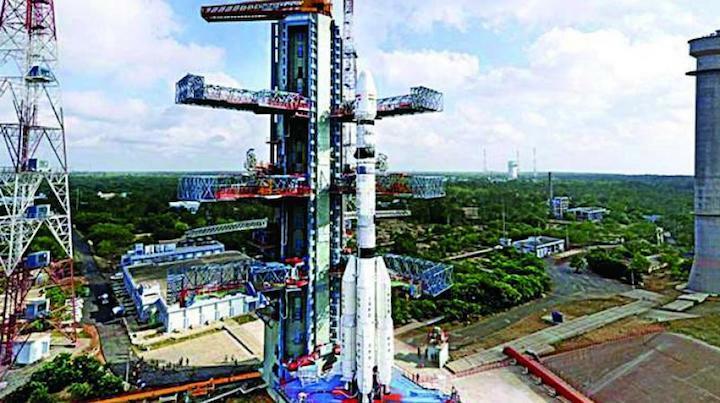 The Chandrayaan-2 spacecraft, which weighs three tonnes, is being finalised at ISRO's satellite centre in Bengaluru and will be hoisted into space from Sriharikota using the Geosynchronous Satellite Launch Vehicle MK II or GSLV MK II. The unique spacecraft will carry 13 scientific instruments that will study the moon like never before. "Chandrayaan-2 will be a breakthrough mission not only for India but for the entire world," said Dr Singh, asserting that the mission "will make every Indian proud". ISRO that hopes to place India's flag on the rover says the launch window opens in April and goes on till October 2018. The rover has to be placed on the lunar dawn and is expected to last at least for 14 Earth days on the lunar surface. It will analyse the soil and look for moon quakes while mapping lunar resources. This unmanned mission, Dr Singh says, packs in 'more power than the Apollo missions by NASA'. Chandrayaan-2 will also reinforce India's capabilities and supremacy in the comity of world nations, he said. India's Chandrayaan-1 mission was an orbiter where India was the captain and there were several global players like USA, Britain, Bulgaria and the European Space Agency. It cost Rs.450 crore and was launched using India's workhorse rocket, the Polar Satellite Launch Vehicle (PSLV) in 2008. ISRO seeks to land Chandrayaan-2 very close to the South Pole of the moon, a very tricky place to land, says Dr Singh. All 12 other moon landings have always been on the lunar equatorial region, this region with its unique geology will give new insights on the origin of the universe, he adds. More than 100 scientists and engineers are working overtime to try and finish the mission on time. NEW DELHI: India's upcoming Rs 800-crore Chandrayaan-2 mission+ will be cheaper than Hollywood's 2014 sci-fi movie 'Interstellar' that cost Rs 1,062 crore ($165 million). In fact, Isro's earlier Mars mission (Rs 470 crore) launched in 2013 was also cheaper than another Hollywood space movie 'Gravity' (whose budget was Rs 644 crore or $100 million) made in the same year. So, what makes Indian Space Research Organisation's space and interplanetary missions cost-effective? In an exclusive interview with TOI, Isro chairman Dr K Sivan explained the frugal nature of their space and interplanetary missions. He said, "Simplifying the system, miniaturising the complex big system, strict quality control and maximising output from a product make our space missions frugal and cost-effective. We keep strict vigil on each and every stage of development of a spacecraft or a rocket and, therefore, we are able to avoid wastage of products, which helps us minimise the mission cost." Isro will try to launch the Chandrayaan-2 mission, involving a soft-landing on the moon's surface and rover walk, sometime in April. However, there are various factors like moon's relative position with respect to the Earth that will decide the launch date. Dr Sivan said, "We are trying for a dawn-to-dusk landing and rover walk on the lunar's mission for maximum utilisation of the scientific mission. If we are not able to land in April due to various factors, then the mission will be launched in November. If we launch between April and Novemberwe won't get the perfect dawn-to-dusk landing and experiment time due to moon eclipses, therefore, we will avoid the launch in between. The perfect timing for the launch comes only once in a month." Unlike Nasa's Apollo and Russia's Luna missions where the rover landed on the equatorial region of the moon, Isro is planning to land the rover near the south pole. The Isro chairman said, "We have chosen the landing site near the south pole as it has big rocks that are billions of years old. Analysing these rocks and the surface will help us explore the moon better and enrich our understanding of the universe." 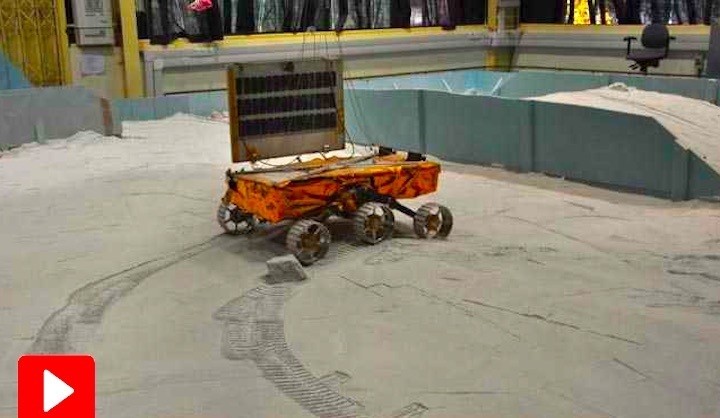 After soft-landing, the six-wheeled rover will get detached from the lander and move 100-200 metre on the moon’s surface and analyse content. It will remain active for 14 earth days (one lunar day) and send back data and images to the Earth via the orbiter within 15 minutes. He said simulations tests on different Chandrayaan-2 components had been going on at Isro centres in Bengaluru, Mahendragiri and Chitradurga, Karnataka. Isro, in fact, created some artificial ‘lunar craters’ as part of ‘hazard avoidance and landing’ tests. Chandrayaan-2 set for April launch? Chandrayaan-2, the lunar mission under which the ISRO will for the first time attempt to land a rover on the moon’s south pole, will be launched in April, Jitendra Singh, in-charge of the Department of Space said last week. 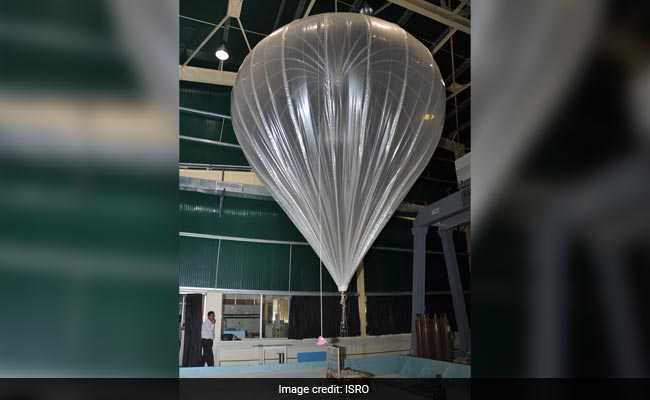 The rover of India’s second lunar mission, costing nearly Rs 800 crore, will be made to land near the yet-unexplored south pole, ISRO’s newly-appointed chairman K Sivan said. “India is going to launch Chandrayaan-2 in April. The Chandrayaan-1 mission spotted water on the moon. Chandrayaan-2 is a further extension of the project and it is as good as landing a man on the moon,” Singh told reporters here. Sivan noted that the window to launch the mission is between April and November this year. “The targeted date is April. In case, we miss the April date, we will launch it in November,” Sivan added. Citing the reason behind landing the rover near the south pole, Sivan said it is a “very tricky area” with rocks formed a million years ago. Chennai: India is all set to create history yet again as ISRO is set for its second lunar mission. ISRO (Indian Space Research Organisation) has revealed a launch timeframe for India's second mission to the Moon - Chandrayaan-2. The second lunar mission is already making headlines as it is said to cost roughly Rs. 800 crore and is expected to be cheaper than the Hollywood sci-fi movie Interstellar (which had a production cost of Rs. 1,062 crores). ISRO has confirmed that it is aiming for an April launch of the Chandrayaan-2 satellite to the moon and this time it plans to send a rover to explore the lunar surface. 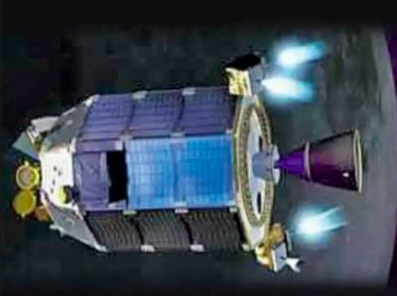 For those unaware, the Chandrayaan-1 mission which was India's first lunar mission and it was launched in October 2008, and was operated until August 2009. 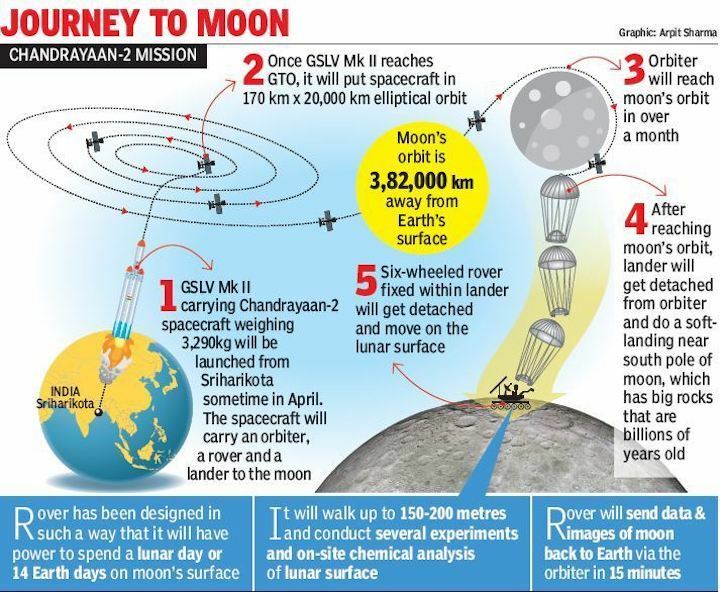 The Chandrayaan-2 satellite would comprise an orbiter, lander and six-wheeled rover which would move around the landing site and instruments on it will send back data that would be useful in analysing the lunar soil. After reaching the lunar orbit, the lander housing the rover will separate from the orbiter. After a controlled descent, the lander will soft land on the lunar surface at a specified site and deploy the rover. 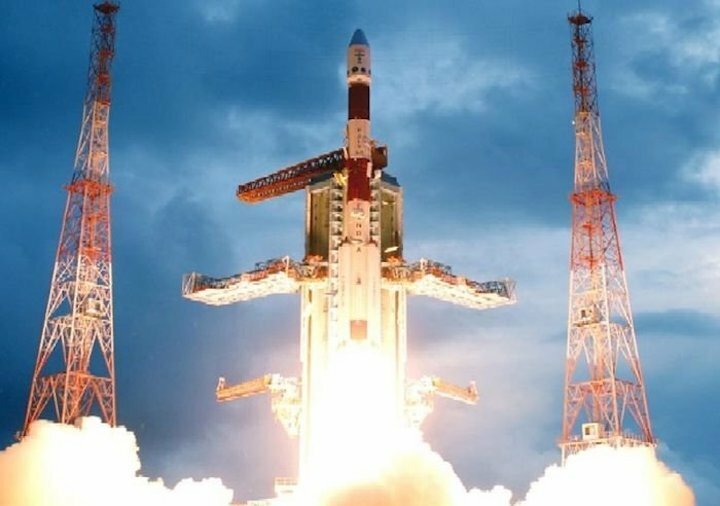 Sivan said scientists were also gearing up for the launch of communication satellite GSAT-6 on-board GSLV-F08, scheduled later this month. "Our immediate plan is a GSLV flight. We are planning to launch it by the end of this month. After that we plan to launch navigation satellite IRNSS-1I," he said. The GSAT-6A is a communication satellite which will provide a platform for developing technologies. It would be useful in satellite-based mobile communication applications. 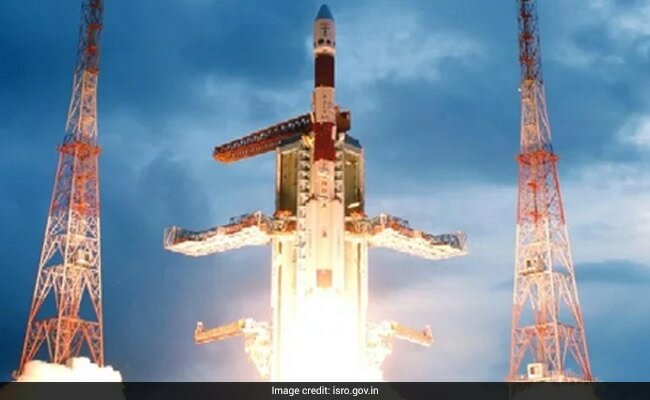 The IRNSS-1I is the eighth satellite to join the NavIC Navigation satellite constellation, which would be sent to a Sub-Geosynchronous Transfer Orbit on-board PSLV as the previous IRNSS-1H launched on August 31, 2017, had become an "unsuccessful" mission. On asking, Sivan said the ISRO was working on developing a mobile application for the benefit of fishermen. "We are working on the app (application). It will inform fishermen where large quantities of fish are available. It will also give them messages about the conditions of the sea. It is in production mode (currently)," he said. 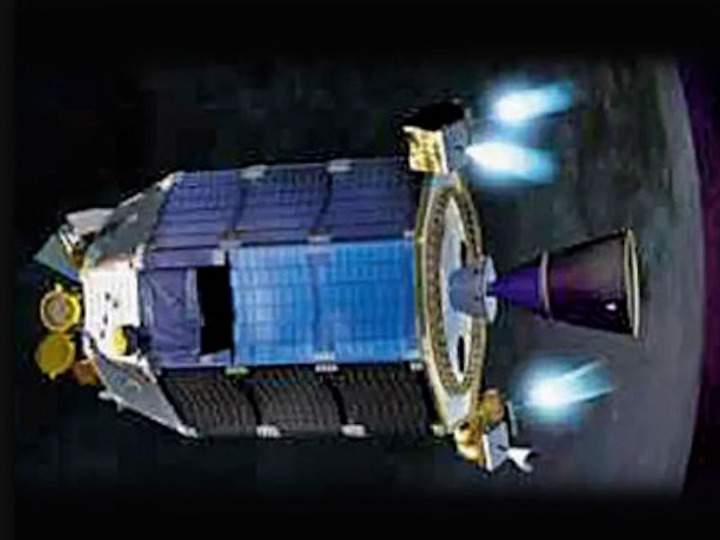 The Chandrayaan-1 mission performed high-resolution remote sensing of the moon in visible, near infrared (NIR), low energy X-rays and high-energy X-ray regions. One of the objectives was to prepare a three-dimensional atlas (with high spatial and altitude resolution) of both near and far side of the moon. In January, the ISRO successfully launched PSLV-C40 carrying Cartosat-2 Series satellite from the spaceport of Sriharikota, about 110 km from here.